Change Management in the VI Service Desk - VIS, Inc. Implementing an ITIL® based Change Management System will significantly help your organization in achieving lower re-occurring incidents (unplanned work), and a structured and consistent framework to effectively solve problems, while building a comprehensive Knowledge Base for future use. According to the IT Process Institute, employing a formal Change Management will help reduce unplanned work from 60% to 25%. Many organizations are at 60% and above. A high volume of unplanned work reduces resource availability and ability to meet agreed service levels. Initiating a Change Request is quick and easy within the VI Service Desk. Click New Change from the left navigator. Complete required fields in addition to any other relevant information at the top of the change form. Selecting a category will initiate any associated change processes/workflows such as Analyst/Group Assignments, Custom Fields, Approvals, Tasks, and Service Level Agreements (SLA). Specify approvers for review of the Change Request and subsequent approval or dismissal. Approval processes may be deployed as Serial or Parallel. Serial has a linear dependency as opposed to Parallel which does not have a specified approval order. 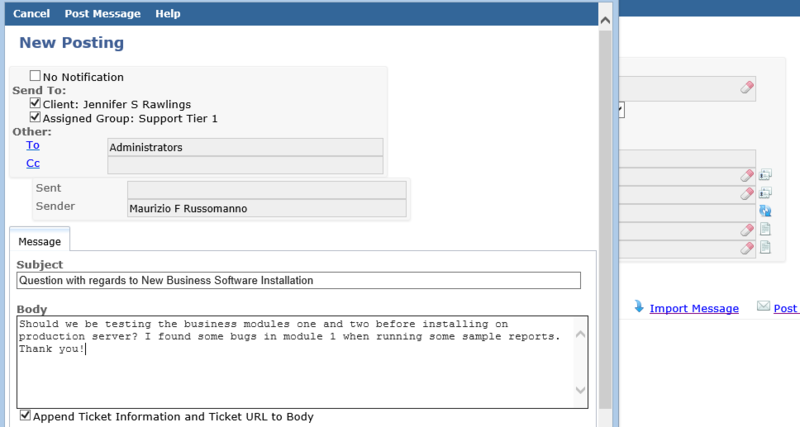 The following screen example displays two approvers for review of a new software change. The approval workflow was configured to assign the requester’s manager Robert S Donahue as the first approver and upon approval, Robert S Donahue is prompted to select the manager who is in charge of approvals for new software implementation in the requester’s specific department. This is one of many approval scenarios which can be configured. Multiple Incidents and Problems may be flagged as pending a Change or linked when caused by a Change. When a Change is closed, assigned analysts of Incidents and Problems pending a Change will be notified so that proper action can be taken on the Incident(s) or Problem(s). 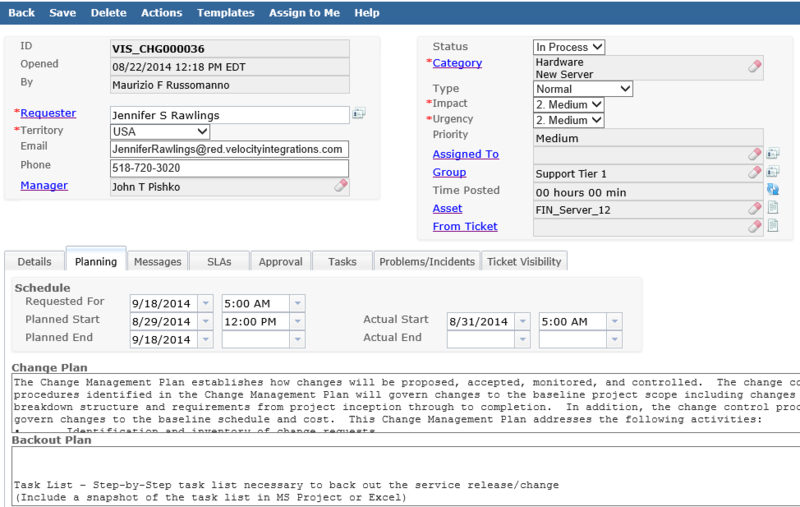 Deploy Task Workflows (groups of related tasks) to manage the steps in performing the Change. Tasks may be manually created or automatically assigned to a Change based on the category that is selected. Specifying a Change Type is an excellent way to classify the disposition of the Change and use this information as criteria for deciding whether a formal change approval process should be initiated. Bi-directional email correspondence can be initiated within the Change ticket for obtaining an answer to a question/concern, receiving critical information, notifying effected users, and much more. As a benchmark and guideline, Planned and Actual Change Dates can be set within the Change document along with a Request for Date.